Showing 49 articles from October 22, 2014. LOUISBURG -- After being rocked by a surprise restructuring at the local hospital that saw 59 people lose their jobs, Franklin County officials and staff have pledged to help the hospital any way it can. County Commission Chair Sidney Dunston said he and county manager Angela Harris spoke with Novant Franklin Medical Center President Jody Morris. FRANKLINTON -- While residents remain split on whether or not to sell the town's water system to Franklin County, the town's board of commissioners has not wavered from its commitment to enter into an agreement to sell. The board recessed its Oct. 21 meeting until Oct. 30, giving them time to review a proposed contract and offer any changes they see fit. Art as therapy and everyone wins! LOUISBURG -- Checking the halls of the Alzheimer's unit every day, Franklin Oaks administrative nurse Rhonda Foreman couldn't help but notice a problem. While she was greeted by smiling patients in the hallways, a view out of back windows was anything but cheerful. 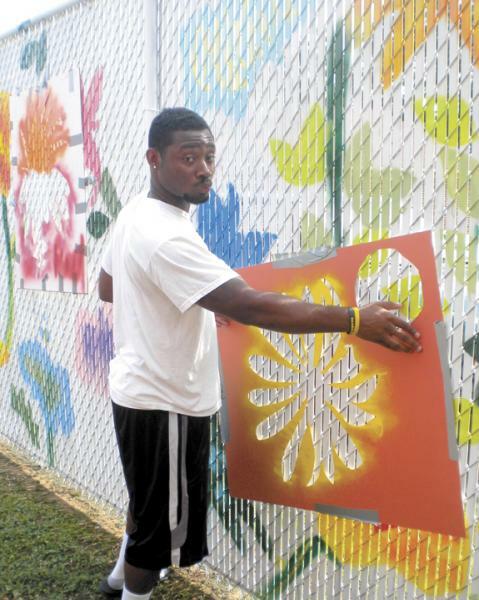 "There was this brown, chain-link fence and it just looked really depressing," Foreman said. "I thought it would be cool to get some students to come to see what they could do (to make it look better). It just snow-balled from there." LOUISBURG -- The Louisburg Town Council filled a vacant seat on the town board Monday night and got a brief update on the recent and drastic downsizing of the local hospital, even though neither topic was on the council's agenda. Former council member George Manley was named to the town board as a replacement for Mary Green Johnson, who resigned earlier this fall. 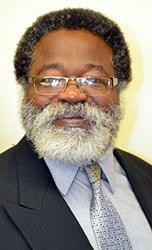 Manley previously served on the board from 1995 to 1999 and will serve out the one year remaining on Johnson's term. Is Bickett Boulevard poised for a long-over-due makeover? Those who routinely travel Louisburg's accident-plagued bypass would probably welcome such a move but it's likely far in the future despite an upcoming informational meeting. It seems that a "working group" of government officials has been tossing around ideas and is now ready to hear from the public. LETTING GO. Brianna Jones' grandparents, from left, Diane Collins and Richard Collins release a balloon. 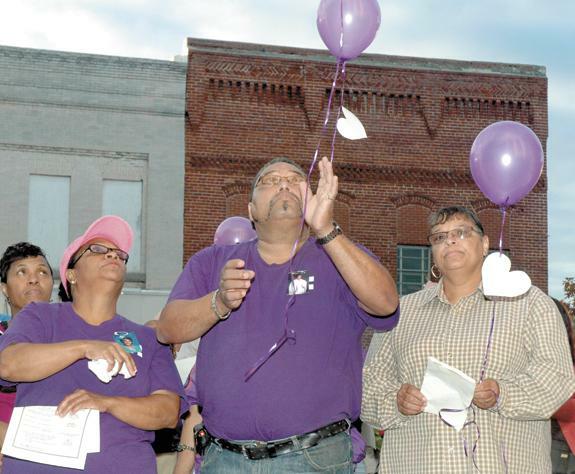 Gracie Jones, right, was also part of the crowd gathered to recognize victims of domestic violence. LOUISBURG -- Akesia Toney and her daughter, Brianna Jones were killed in December 2013, the result of domestic violence. Their longtime friend, Kenda Greene, though, urged people last week to remember the courage by which they lived. Safe Space Inc. held its annual candlelight vigil to remember victims of domestic and Greene spoke for Toney and Jones, who were killed by Toney's estranged husband, Rickey Toney. Health care access must be the focus now! The real victims of Novant's recent downsizing of Franklin Medical Center are the potential patients -- and most significantly the elderly and poor -- who will have a more difficult time getting access to medical care. Let's not forget that basic truth as the finger pointing begins about what caused this massive setback for Franklin County -- and speculation about how its repercussions will ripple across the county. 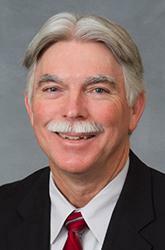 All of us remember those days when state officials in Raleigh were talking about balancing the budget and cutting expenses. Some Tar Heels cheered loudly, some were happy, but quietly so, and a few trembled at what the ultimate effects of those decisions would be. Regardless of which group you were in, recent days provided some concrete examples of the effects of those decisions. And those decisions, whether you agree with them or not, had consequences. As I was getting ready for work this morning, I was listening to the radio and a woman's voice made comment about the signs of fall. An apparent friend asked just what those signs were. Was it the changing color of the leaves? Was it the drop in temperature? Voting: Right, privilege or responsibility? 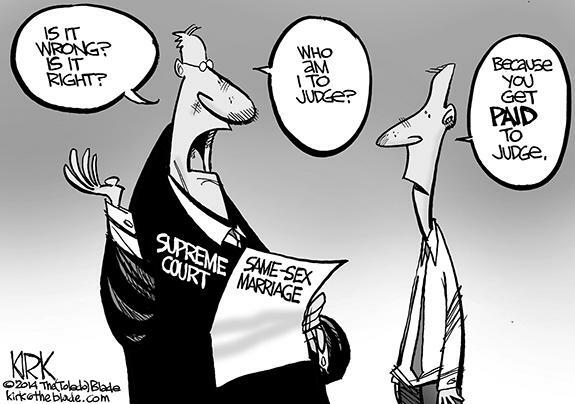 Many see it purely as a right; something they are entitled to. I see voting as all three, most important of these being responsibility. Have you noticed how some words and phrases now have different meanings than those you were taught, or once believed? Examples include words like progressive, liberal, and entitled. Phrases like, I am a Republican, I am a Democrat have taken on very different meanings. 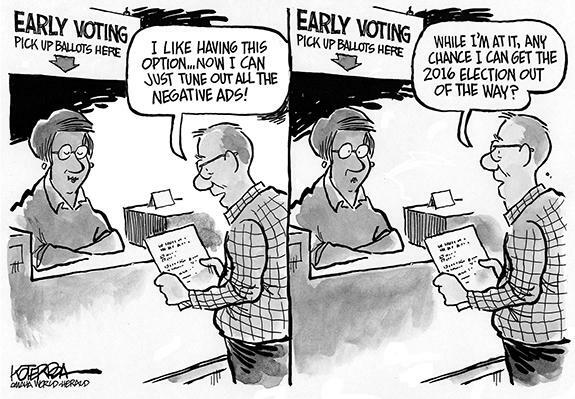 Today is the first day of early voting in North Carolina. It is also an opportunity to rid ourselves of some problems before they do more damage. For proof, I offer the lead story of this newspaper's last edition. Our local hospital has effectively been reduced to an emergency room and two beds. It has been apparent to me for several years that leaders of the Republican Party are trying to harm public schools. In my opinion, the pay raises for teachers this year was not something they wanted to do, but they read the handwriting on the wall that their political careers made it a necessity. CATONSVILLE, MD- Funeral services for Dorothy "Hazel" Stokes Person, 71, who died Tuesday, Oct. 21, 2014, will be held on Saturday, Oct. 25, at 12 noon at Hickory Grove Baptist Church, with the Rev. Bobby Thomas officiating. Burial will follow in the church cemetery. 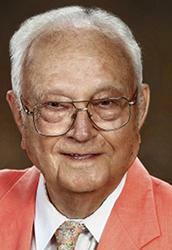 HOLLISTER - Funeral services for Lynwood C. "Bro" Cyrus, 85, who died Sunday, Oct. 19, 2014, will be held Friday, Oct. 24, at 11 a.m. at Pine Chapel Baptist Church, with the Rev. Wilson Battle officiating. Burial will follow in the Pleasant Grove Church cemetery. LOUISBURG - Robert Preston Alford, Sr., 70, of Louisburg, died Saturday afternoon. HOLLISTER - Funeral services for Ruth L. Lynch, 79, who died Friday, Oct. 17, 2014, will be held at 2 p.m. Tuesday, Oct. 28, at Walnut Grove Baptist Church in Hollister, with the Rev. Mike Cummings officiating. Burial will follow in the Lynch family cemetery. CHARRON SHINES. Franklinton's Nelson Charron (right) tries to gain possession of the ball during Monday's soccer contest versus Durham Arts. 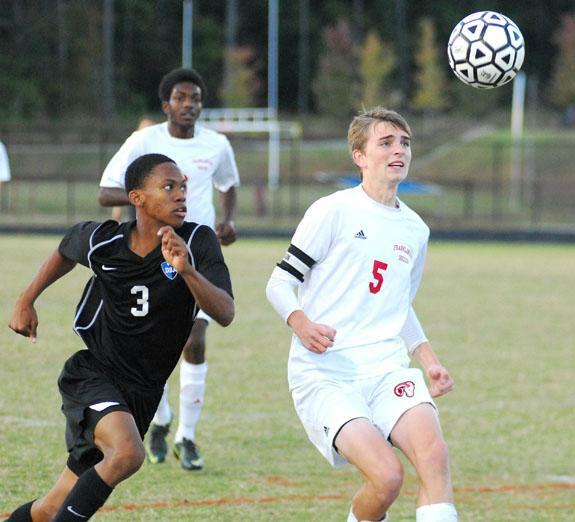 FRANKLINTON -- Last season, Franklinton had an opportunity to win the Northern Carolina Conference boys soccer championship at home -- only to lose in the final game. It was a scenario that the Red Rams weren't about to repeat in 2014. Given a second chance, Franklinton gained a measure of redemption during Monday's meeting with Durham School of Arts at the FHS Football Field. SLIP SLIDING AWAY. 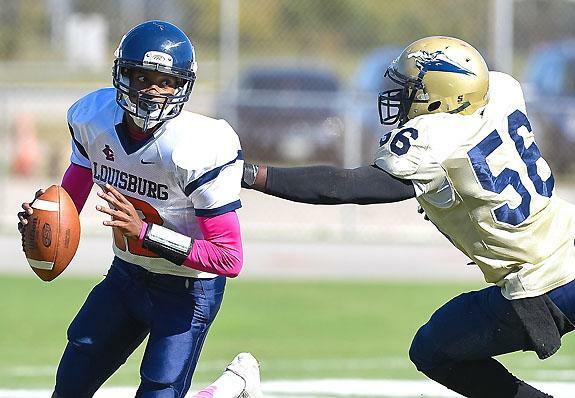 Louisburg College quarterback Darron Downing (left) escapes a tackle attempt during the Hurricanes' road victory on Sunday against the North Carolina Wesleyan JVs. LOUISBURG - Louisburg College took a short road trip on Sunday -- with one eye on a much longer journey this coming weekend. The Hurricanes took some time out from their rigorous Northeast Conference schedule for a gridiron meeting in Rocky Mount against the North Carolina Wesleyan College junior varsity squad at the RM Municipal Stadium. UP FOR GRABS. Warren County's A.J. 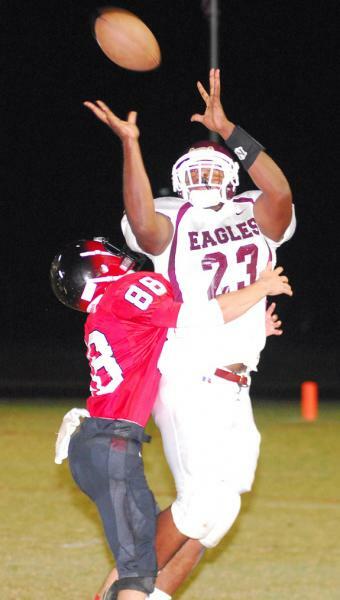 Alston tries to come up with a reception while being defended by Franklinton's Chrysten Madrid last Friday night. FRANKLINTON -- Coming into the game, Franklinton football coach Jeremy Buck felt a tinge of anxiousness about his club's chances last Friday against Northern Carolina Conference rival Warren County. Due to a postponement, FHS was just four days removed from a key league win against South Granville. And Buck knew that Warren County was a dangerous opponent -- a talented squad that was one everybody's preseason radar as a potential league spoiler. FHS TABLESETTER. Franklinton senior Tiara Wilkins (right) sets the ball during the Lady Rams' matchup last Wednesday against South Granville in the NCC Vollebyall Tournament in Creedmoor. 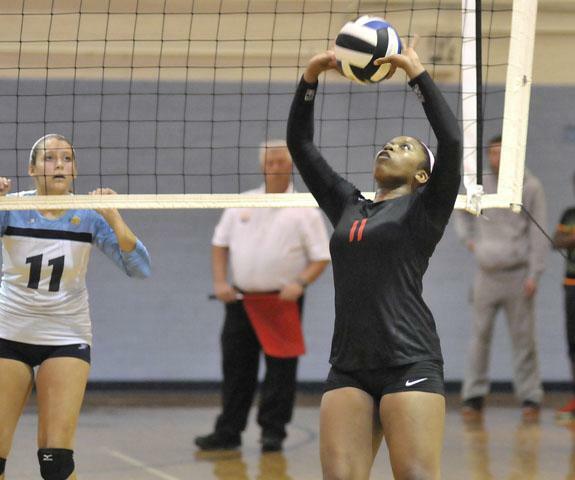 NEWPORT -- Not all great seasons have a happy ending, as evidenced by Franklinton's loss at top-seeded Croatan on Tuesday in the second round of the Class 2-A State Volleyball Playoffs.. The Red Rams took the home team to the limit before falling in heartbreaking fashion in five sets. 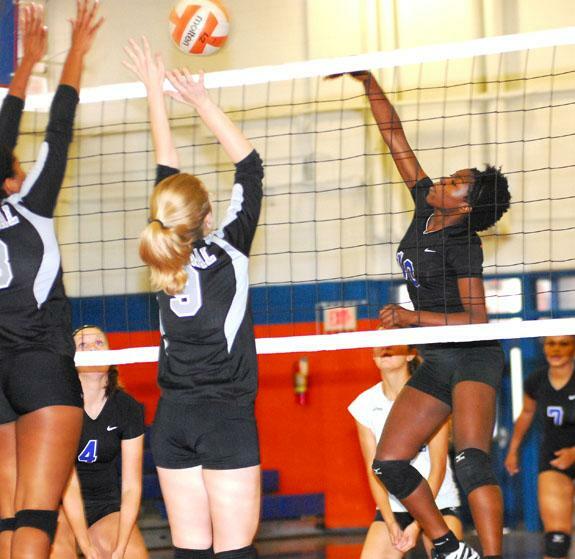 Scores were 25-21, 25-14, 12-25, 21-25 and 15-9 in favor of the undefeated Cougars. ROANOKE RAPIDS -- The topsy-turvy, high-scoring world of Northern Carolina Conference football took another twist last Friday with Roanoke Rapids' comeback victory at home against Bunn. Trailing by eight points down the stretch, the Jackets responded with a field goal and touchdown to outlast the Wildcats by a 38-35 margin at Hoyle Field. Franklinton at Bunn 7:30 p.m.
Louisburg at Northwest Halifax 7:30 p.m.
WASHINGTON -- There's something about being on the road for the Class 2-A State Volleyball Playoffs that appeals to the Bunn Ladycats. Last year, the Ladycats reached the Elite Eight of the postseason, with all of the wins coming courtesy of long journeys out of Franklin County. SENDING IT FORWARD. 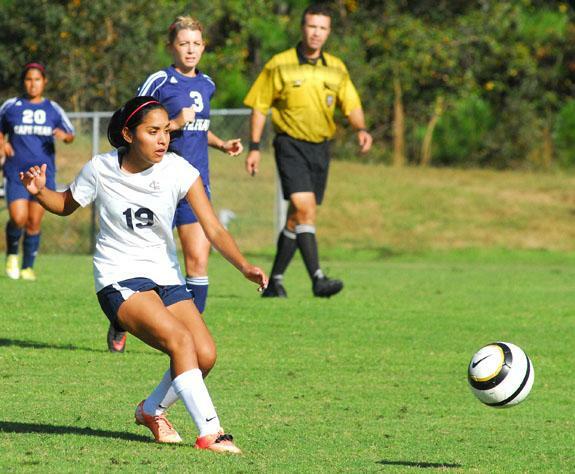 Louisburg College's Kenia Roa advances the ball during Monday afternoon's key soccer victory against Region X rival Cape Fear CC. LOUISBURG -- Louisburg College's women's soccer team picked the right time to peak two years ago, winning region and district championships en route to qualify for the nationals for the first time in school history. It was a journey LC coach Andy Stokes would love to repeat this fall -- and his club's recent success has brought back memories of 2012. SPIVEY SPARKLES. 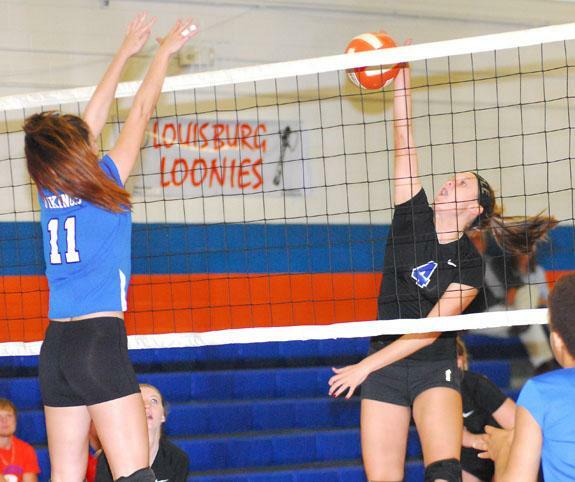 Louisburg High School's Phoenix Spivey (right) goes up for a blast during the Lady Warriors' home victory over Granville Central in last Wednesday evening's championship match of the Tar-Roanoke Athletic Conference Tournament. 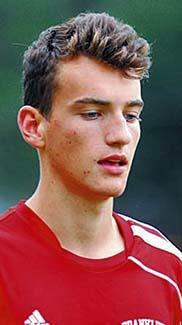 LOUISBURG -- Under typical protocol, the Most Valuable Player of the Tar-Roanoke Athletic Conference spike season isn't supposed to be announced until the conclusion of the league tournament championship match. Louisburg High School veteran head coach Erica Wammock decided to change things up last Wednesday evening in the finals of the TRAC Volleyball Tourney at the LHS Gymnasium. 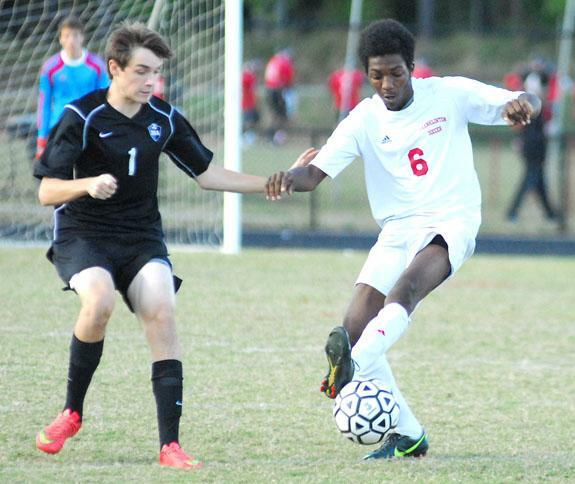 LOUISBURG -- The Louisburg Warriors boys soccer team closed out the 2014 season with a 6-2 thumping of Tar-Roanoke Athletic Conference foe KIPP Pride Panthers on Tuesday night at Joyner park. Seniors Daniel Calamaco and goalkeeper Brevonte Bullock both contributed, with Calamaco finishing the game with a goal and assist. BOLTON'S BEST. Louisburg High School's Whitney Bolton (right) delivers a kill for the Lady Warriors during Tuesday evening's home playoff victory against Plymouth. LOUISBURG -- Plymouth provided an unorthodox, pesky challenge for the Louisburg Lady Warriors in the second round of the Class 2-A State Volleyball Playoffs. The visitors used a high-risk, high-reward service strategy, with lasers either landing on the floor for aces or bouncing long -- or into the net. GASTON -- Just four days removed from a disappointing loss to Southeast Halifax, the Louisburg Warriors got healthy in a hurry during a visit last Friday to Tar-Roanoke Athletic Conference foe KIPP Pride in Northampton County. The long journey proved to be well worth it for the Warriors, who spread the wealth offensively en route to securing a 50-0 decision. DOVER, DEL. 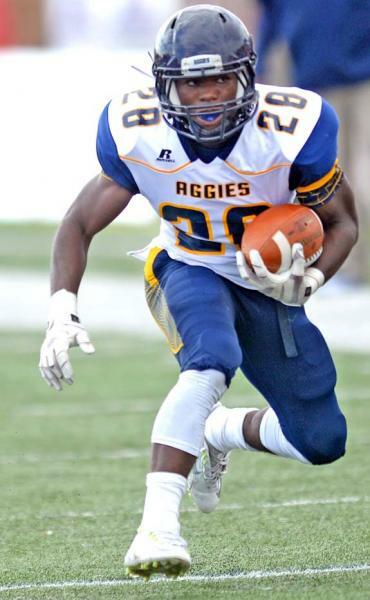 -- Tarik Cohen's big season for the North Carolina A&T Aggies continued last Friday as his club secured a 33-30 road victory at Delaware State. Cohen, a sophomore from Bunn, rushed for 148 yards on 36 attempts to spark the Aggies. He also caught five passes for 28 yards. 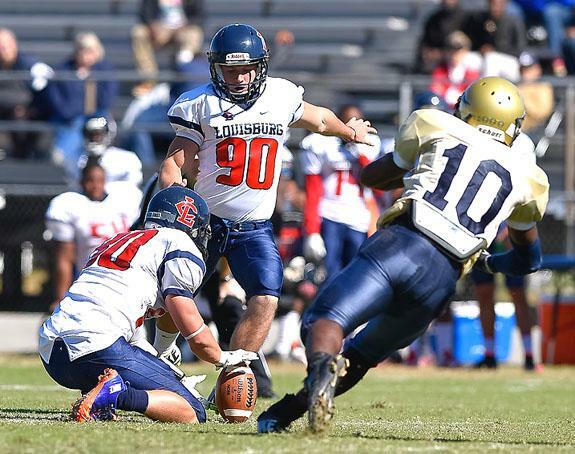 Louisburg College's Matt Paul converts an extra point during Sunday's road conquest. 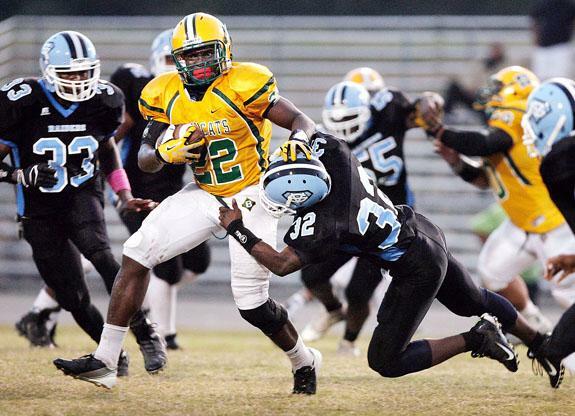 Bunn native Tarik Cohen has been effective this season as a sophomore running back for the North Carolina A&T Aggies. Franklinton's Preston Mason-Eaton wins a 50-50 ball during Monday's home triumph. 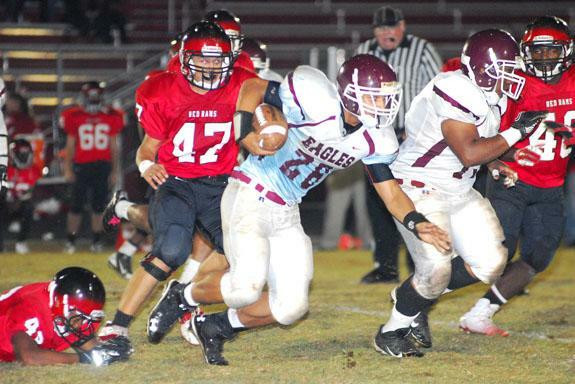 Darius Hargrove (with ball) had a strong game for the Warren County Eagles during last Friday night's Northern Carolina Conference road victory against the Franklinton Red Rams. Melissa Anne Cherry and John David Rock Jr. were married on Saturday, Sept. 13, 2014 at 4 p.m. at Wrightsville United Methodist Church in Wrightsville Beach. The Rev. Bob Bauman officiated. Following the ceremony, the bride's parents hosted a reception at Country Club of Landfall. On Friday evening, the groom's parents hosted a rehearsal dinner at the Surf Club in Wrightsville Beach. 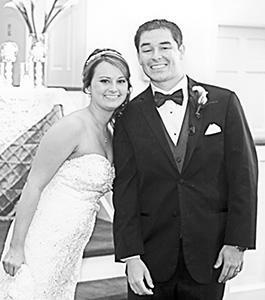 Chelsey Renee Roberson and Wrenn Christopher Smith were united in marriage on June 14, 2014 at 5 p.m. at Harris Chapel Baptist Church in Youngsville. The Rev. Allan Gardner officiated the ceremony. 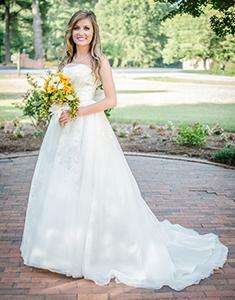 The bride is the daughter of Kelly S. Roberson of Louisburg, and Mr. and Mrs. Terry W. Roberson of Henderson. Chelsey is also the granddaughter of Mr. and Mrs. Ned H. Smith Jr., Sandra Reavis, and Mr. and Mrs. Charles M. Roberson. The marriage of Bethany DeAnne Holton and Joseph Clark May was celebrated Oct. 4 at 6 p.m. at Louisburg United Methodist Church in Louisburg. The ceremony was performed by the Rev. 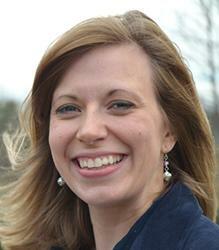 Madison Hankal, pastor of Louisburg United Methodist Church. Franklin County resident Diane Taylor Torrent presented the Franklin County Library with a copy of her recently released book: Images of America: Franklin County. 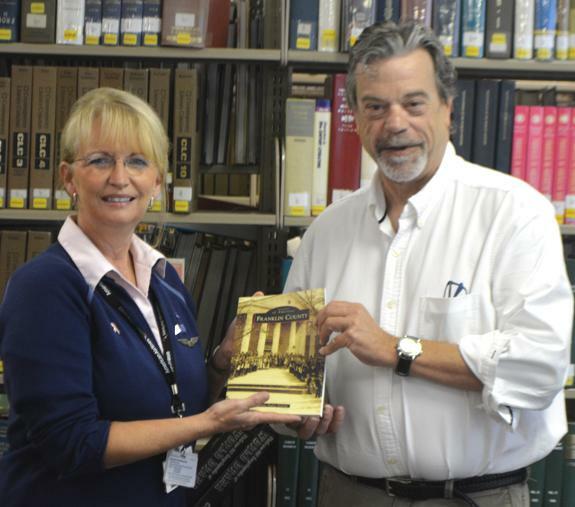 Shown here accepting the book is Librarian Holt Kornegay. The book includes 200 vintage images of Franklin County, many of which have never been published, showcasing memories of days gone by. Neil Holden of Youngsville was honored for his service to the people of Franklin County by the Franklin County Committee of 100 recently. 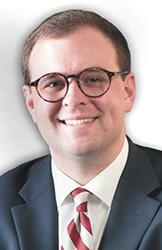 Holden is a prominent Youngsville businessman whose family was long time owners of Holden's Barbeque. 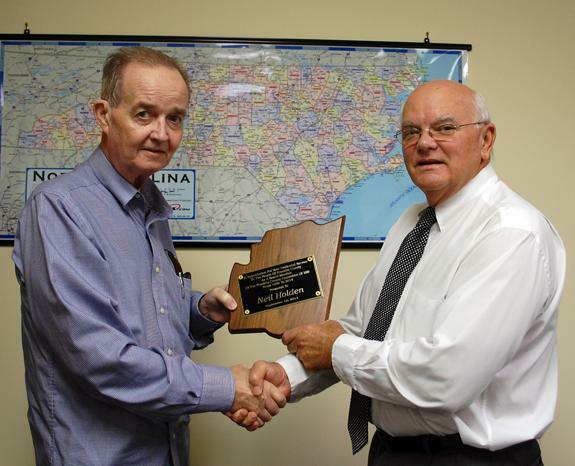 He received a plaque in recognition of his long-time service from Franklin County's Economic Development Director and Assistant Treasurer of the Committee of 100, Ronnie Goswick. LOUISBURG -- The charges against a Franklinton man accused of killing a man outside a Louisburg convenience store this summer were dropped. Louisburg police arrested James Scott Perry II on Aug. 23, hours after they allege he shot and killed Doran Long during an altercation in the parking lot of a S. Main Street store. A story in the Oct. 16 edition of The Franklin Times attributed a comment to Novant Health Franklin Medical Center Kathryn Knight, stating that eliminating positions was the most fiscally effective approach for the hospital in relation to a projected $6.1 million loss this fiscal year. Children: Jean (husband Ray Griffin) and Trudy (husband Jerry Collier) and three grandchildren, one great grandchild, and one great-great grandchild. LOUISBURG -- A nonprofit group formed to bolster and develop business in Franklin County has filed a complaint, seeking to recoup a bad loan giving to a Franklinton businessman. The Franklin County Committee of 100 loaned Phillip Young $17,000 in July 2010 to help him operate his business, the Philling Station in downtown Franklinton.